After all the excitement of the recent MORI and Angus Reid polls tonight’s telephone poll from ComRes shows very little change on the last phone poll from the firm for which the fieldwork finished on January 9th 2011. The changes on that are CON nc: LAB +1: LD -2 The direction, to Labour, is consistent with other surveys. ComRes operates in two entirely different ways – it’s continuing to use its conventional telephone polling with some surveys and since last autumn it is also doing online surveys. These are, in fact, two different polling series and should be regarded as such. In its non-VI question the pollsters found, unsurprisingly, that 94% of people thought it wrong to hack the private telephone voicemail messages of celebrities and 92% thought the same about politicians. Two in three people believe the allegations about hacking show that the newspaper industry should no longer be allowed to regulate itself. And the same proportion think that David Cameron showed poor judgement in employing Andy Coulson as the Downing Street director of communications because he had already had to resign as editor of the News of the World over the hacking scandal. So overall – not very exciting. Is Kellner right – Labour should be polling better? Should the lead be 10 percent plus? 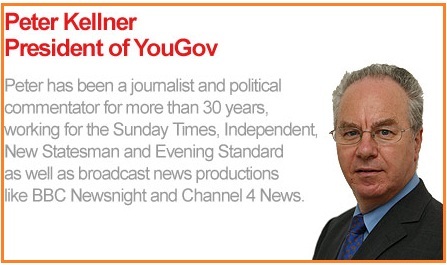 The president of YouGov and well-known Labour supporter, Peter Kellner, has put the cat amongst the pigeons with an article this afternoon saying that his party should be doing substantially better in the polls. This is particularly so because unlike before the creation of the coalition Labour is now the “only major, Britain-wide opposition party”. Labour has an effecting anti-coalition monopoly yet is failing to attract enough of the anti-government support. Looking forward, of course, the current effective three sided choice that voters have – supporting the government, Labour or the minor parties is not likely to exist at the general election. 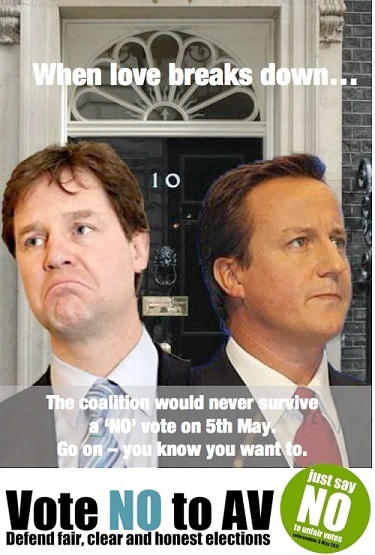 The coalition partners will probably go their own way for the campaign presenting a four choice range of options. The polling situation is made much more complicated by the fact that a large slab of Tory and Lib Dem voters from last May are simply saying now that they “don’t know” – rather than switch to Labour. One reason why ICM is showing a different picture for the LDs and, to an extent, the Tories is that it operates its formula for dealing with the “don’t knows” who say they will vote. The pollster allocates half in line with what those people said they did last time. If all the pollsters operated in a similar fashion then Labour’s position would looking nothing like as it does at the moment. The AV referendum is predicted to result in a â€œNoâ€ vote â€“ thatâ€™s the main finding from the 2011 Politicalbetting Prediction Competition. 104 of the siteâ€™s sharpest pundits took part in PBâ€™s annual crystal ball-gazing exercise, looking at everything from the state of the party leaders at Christmas and the opinion polls, to UK interest rates, the GOP race and the Irish election. Full details of the player-by-player predictions are available here. Competition entrants expect the Yes vote in the AV referendum to be about 45% – only 33% of entrants predicted a Yes vote of 50% and above. There is a very high expectation that Cameron, Clegg, and Miliband will be PM, Deputy PM, and Labour leader at Christmas, Miliband having the lowest score here with 94%. However, only 20% of respondents predict that Alex Salmond will still be Scottish First Minister by 25th December, while in the race to be the Republican presidential nominee, Mitt Romney has a clear lead as the expected poll leader by Christmas, with 46% of respondents, while Sarah Palin came in at 22%, not far ahead of Mike Huckabee on 15%. Meanwhile new Fianna FÃ¡il leader MicheÃ¡l Martin has received a major boost with the news that FF are predicted to win a meltdown-avoiding 40 seats in the upcoming Irish election. In the opinion poll predictions (using PAPA), the average highs and lows for the three main parties were (Lab/Con/LD) 45/41/16 and 37/33/8, with the average for the largest Labour lead being 10 points, and the average largest Conservative lead being 1 point. Elsewhere, the Leaders and Finance predictions for December 2011 have been published in the Election Game, with 80 entries altogether. In the Leaders game, players were asked to â€œbuyâ€ or â€œsellâ€ leaders according to whether they would be in a named post (usually their current one) at 31st December. Buy percentages included 78 for Theresa May, 69 for Liam Fox, and 61 for Ken Clarke, but just 54 for Peter Robinson, 38 for Vince Cable, and 31 for Alex Salmond. Abroad meanwhile, 60% of respondents â€œboughtâ€ Berlusconi, while 55% said that Palin would be a declared candidate at the end of the year. Average Finance predictions for 30th December were as follows: FTSE 100 6279, US Dollar $1.5854 to Â£1, Euro â‚¬1.2595 to Â£1, and the oil price (Brent crude) to be $100.87 per barrel. Full details of the Election Game predictions are here (click on the 2011 tables) and the next game will be for Ireland. Finally, can I wish all PBâ€™ers a very successful 2011 in punting â€“ did anyone else cash in on Martin as new FF leader? And for my money, by far the most interesting political story at the moment is Egypt – Al Jazeera has generally had the best coverage IMHO. Will a referendum delay help YES or NO? What’s the consequence of not holding it on May 5th? 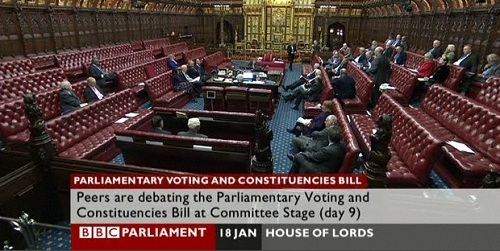 In the next few days big decisions will have to be taken on the voting and constituencies bill which has been held up by the massive Labour filibuster in the Lords. I think that de-coupling would be too hard a measure for the Conservative party, which is none too keen on the referendum part anyway, to swallow and that if resistance continues then putting back the referendum is quite possible. This would almost certainly mean that the referendum would be the only election taking place on the new date which is likely to have a huge impact on turnout. My guess is that it would be in the mid-20s as opposed to the mid-high 30s if it’s on May 5th. What’s hard to call is which side would benefit most from fewer people overall taking part? Who are most motivated to vote? What polling there’s been suggests that the traditional high turnout demographic segments, the older middle-classes, are less enamoured with change than the young. That could be balanced by the YES campaign having a more positive message than NO. I also wonder whether the Tory polling position might cause some in the party to change their traditional view. Essentially the blues believe that voting reform could stop them from ever forming a majority government again. But if the polling suggests that there is no prospect of an outright victory anyway then voting reform could be seen as helping the coalition parties prevent Labour from returning. 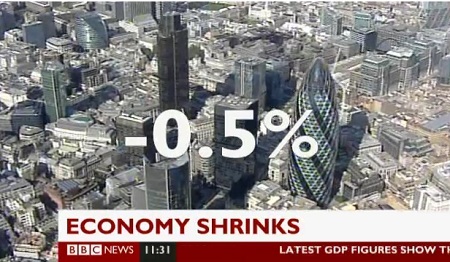 The big political story of the week was the shock economic growth figures. The initial estimate for Q4 2010 was that the economy shrank by 0.5%. This was much worse than anyone expected. The political reaction was fascinating. Now that the dust has settled, how do we think the parties handled the surprise and what are the implications for the future? George Osborne blamed the weather. A political slight of hand designed to buy him time. He needs breathing space, because there is real uncertainty about what is going on. Whilst the chancellor is technically correct to point out the costs of snow, the underlining figures were a puzzle. The government estimated that with sunnier skies, the economy would have stood still; a terrible result for a country emerging from recession. Are things really that bad or are the figures incorrect? The chancellor has three months to understand what is happening and if necessary formulate a response. It wonâ€™t be easy since he has bet all his political capital on the cuts agenda. So it is understandable that he wanted to buy time. Work might already be underway in the Treasury on a plan B; it is interesting to note that tax cuts are increasingly mentioned in the press. Meanwhile the shock figures meant, for the first time since the election, Labour was listened to on the economy. It was a timely opportunity for the new Shadow Chancellor to make an impact and he handled it with restraint. He fully accepted the impact of the weather and was relatively upbeat, suggesting that a double dip recession was unlikely. The shadow chancellor had little choice but to strike a low-key, positive tone. Labourâ€™s economic reputation is so damaged it cannot yet say â€œI told you soâ€ or risk crying wolf. It was progress for Labour to be heard at all. And so long as Labourâ€™s own economic policy is unclear; the party is not in a position to sustain a robust attack on the government. All eyes will be on next quarterâ€™s results. For now a recession is technically unlikely, but ironically that could change if the 2010 Q4 figures are revised up. A forced policy u-turn would obviously reduce confidence in the Tories. The Lib Dems urgently need an economic spokesman to replace Vince Cable. And now that the public are listening, Labour needs to clarify its economic message and work hard to earn public trust. One final point, whilst Osborne cited the weather as an excuse for poor figures, isnâ€™t it time the UK functioned better in the snow? Other countries grew despite the record low temperatures. Are not these figures a wake up call about our infrastructure? If it costs us so much every time it snows, it would surely be a sound investment to make the UK more resilient. We should aim to grow whatever the weather. All three main party leader can take some comfort from today’s YouGov leadership ratings just out. And after seeing the collapse in Cameron’s approval ratings in the January MORI figures there’s no sign of any such movement from YouGov. Compared with the last YouGov poll of 2010 the Tory leaders’ numbers are almost identical. It should be noted, however, that YouGov asks a different question – whether the leaders’ are doing well/badly. The MORI approach is more specific to the person being questioned and asks whether they are satisfied or dissatisfied with how the leaders are doing their jobs. In spite of that you would expect moves in the same broad direction. That hasn’t happened. The leader who’ll be most relieved this morning is Nick Clegg who sees the best ratings since November 19th – just before the tuition fees issue became centre stage. Ed Miliband can also feel pretty pleased getting his best “well” figure since early October, just after he became leader. Should the blues be worried about Dave’s ratings’ collapse? Was January a blip – or the continuation of a trend? As PB regulars know I take a lot of notice leadership approval ratings particuarly those from MORI which has been asking the same questions for more than thirty years. Also, taking the lead from several leading academic political scientists who track this, my main focus is on the “satisfaction” figure and I’m less concerned about the negatives. In terms of predicting electoral outcomes it’s the proportion saying they are satisfied that is key. Whether they “don’t know” or are not satisfied is irrelevant – they are not ready to be positive. In the immediate aftermath of the election and the formation of the coalition Cameron’s rating moved to 57% and only three months ago it was still in the 50s. By December it was at 48% dropping by a huge ten points since then. Now it might be the January figure is an outlier and cerainly the fieldwork for the poll took place over last weekend in the aftermath of the Coulson departure. We need to look at the next couple of months before drawing too many conclusions – but even so this figure should be worrying particularly as other pollsters asking similar questions have been coming up with the same broad trend. Also Cameron is at his best when things are bad for him and I thought that this week’s PMQs’ performance was his most accomplished for some time. 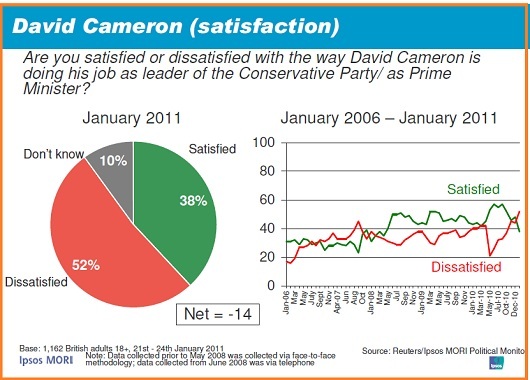 In September 2007, at the height of the Brown honeymoon, Cameron’s MORI rating dropped to just 23%. He went on to play a blinder at the party conference and we all know what that led to. One thing’s for certain – his honeymoon is certainly over. Historical point re MORI The firm underwent a major methodological change in June 2008 as is highlighted in their tables. Figures before then cannot really be compared with those since. Might AV work to their advantage? Politics often boils down to a mixture of high principle and low expediency or interest. The debate on voting reform has long been a classic example of the sort. It is hardly coincidental that all three main parties have produced principled arguments that just happen to support a voting system that is particularly favourable to them. One 1997 election promise that Labour were open about not keeping was their proposed referendum on voting reform. Eighteen years of opposition makes you take reform seriously; winning a 177-seat majority returns it to the backburner. By contrast, the Lib Dems have been very keen on STV – a system likely to impose a sufficiently high barrier to keep minority representation to a minimum but which is beneficial to centrist parties polling in the mid-teens and above. Likewise, the Conservatives were believed to benefit – both by themselves and by their opponents – under FPTP from a split centre-left vote. That might well have been true in the 1980s, though tactical voting during the Blair years minimised and possibly reversed it. As with so much else, the formation of the Coalition might overturn these old assumptions. The centre-left vote is largely solid behind Labour while itâ€™s the centre/centre-right vote thatâ€™s split. Even more pertinently, the notion that the Lib Dems would always back Labour in the Commons has been demonstrated to be very much false. The Oldham East & Saddleworth byelection provided plenty more evidence of a willingness of the change in votersâ€™ tactical behaviour, with a clear swinging of a large portion of the Tory vote behind the Lib Dem candidate. Nor is it just the three big parties in play. The transferred votes of UKIP, the Greens and BNP will matter at the margins, and of these, UKIP would probably be favourable, the Greens not so (unless indirectly via electing Lib Dem coalition partners), and the BNP anyoneâ€™s guess. And yet the Tory vote remains probably set in favour of FPTP. Certainly the party leadership and membership does. The polls vary wildly: YouGov – with bespoke wording – consistently reports a split of around 25-58 against, Angus Reid has Yes and No almost neck-and-neck with the blues, and ComRes reports the break to be 24-43. Will that change? The main argument against AV – that it leads to hung parliaments and so weaker government – becomes ever more difficult to sustain while a coalition government carries through a policy of deep and unpopular cuts. â€˜Yesâ€™ can be backed at odds-against – e.g. 6/5 with Hills – and there probably is some value in that.